January 2017 was characterized by low temperature and rather dry weather. Character of the weather changed during February. It got significantly warmer but the dry weather kept going. The average temperature reached 1,7°C while the long-term average is 0,4°C. This March was ordinary as for the precipitation, but highly above standard as for the temperature. The average temperature reached 6,8 °C while the long-term average is just 4,3°C. High temperature caused fast sprouting of hop plants and majority of them had noticeable shoots at the time of cutting. Warm weather continued in the first half of April, but it turned cold in the second half of April and cold weather remained till the beginning of May. April was rich in precipitation. The monthly aggregate rainfall was 51,4 mm compared to the long-term average 30,7 mm. Hop cutting started by the end of March. The majority of hop gardens in the area was cut till the second decade of April. Hop stringing started immediately after the cutting. 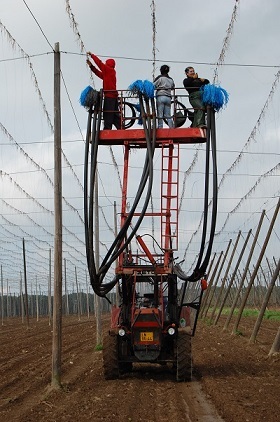 By the end of April stringing was done on 80% of hop gardens. Cold weather during the second half of April caused very slow hop growing after the cut. Nowadays the majority of the plants are in growing phase BBCH 08 (= start of sprouting after the cut) to the phase BBCH 11 (= first pair of developed leaves). Chemical treatment of hops has not been made yet as the hop plants had not got sufficient leaf surface for aplication of chemical protection.